-Hippocrates quote “ars longa” or “the art is long (-lasting)”. Of course he would have said it in Greek, not Latin, and he’s referring to medical skill, but whatever. It’s always a good day when Hippocrates shows up in modern media. 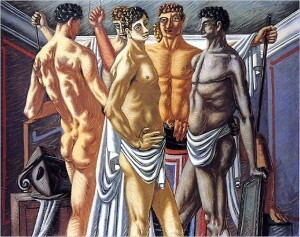 -de Chirico’s ‘Gladiators at Rest’ (1928-29); de Chirico works a lot with classical references and images. For more, take a look here. Wooo Hoooo! A hat tip. Finally.